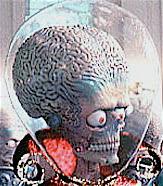 An activist in this city - a man who very much resembles my theoretical character, Your Neighbor and to whom I have occasionally referred to as The-Brain-Who-Ate-Costa-Mesa - has exercised his influence over several past and current members of the City Council and their appointed surrogates on the Planning and Parks and Recreation Commissions. Much of what he has espoused from the speaker's podium and in correspondence in the local media and on his blog have a central theme - the expulsion of the Latino population from our city. Of course, he and his acolytes have denied this many times, but actions speak louder than words. I pay attention to his postings on various white supremacist web sites, painful as they are to read. This guy has frequently spouted that the essays in question are not racist, and that only those of small minds (he professes to be a MENSA member) would think that. We lesser beings lack the mental horsepower to really understand the depth of his message. Yep, I guess that's right - I don't understand that his mantra of racial purity is not really racism. I don't understand that his denigration of "lesser races" is not really racism. Imagine my surprise (tongue in cheek) when I found, on the official web site of David Duke - former head of the Ku Klux Klan - this link, which carries the most recent of Your Neighbor's essays entitled "White Buck Shoes and the North American Union". The text of this essay refers, once again, to the "blending" of the American populace - the homogenization of the races through interracial marriage. Apparently Duke, long the poster boy for racism in this country, thinks Your Neighbor's views are just dandy - so much so to feature them on his official web site. So, as you read that essay and consider it's source, I hope you'll contemplate the influence this man has had on your elected leaders and their appointees and what this means to the future of this city. Consider whether you really want the future of our city guided by the hand of such a man. I hope you'll consider how the radical right has taken over our city, as witnessed by the gushing support provided during the campaign to our young jailer/mayor and his barnacle, Wendy Leece, by Jim Gilchrist, Grand Pooba of the Minutemen and his frothing band of Minuteman Mob supporters. I hope you'll consider these facts when you think about the amount of out-of-town money that flowed into the mayor's campaign war chest and dribbled over into Ms. Leece's campaign, too. Some observers have said I give Your Neighbor too much credit for things that happen in our city - that he's really a smart, yet pathetic guy who has not found a positive way to direct his prodigious intellect. Well, maybe - but from where I sit (with my tin foil hat, tuna cans on my ears in my grungy skivvys, according to him), the trail is clear and his influence is obvious. 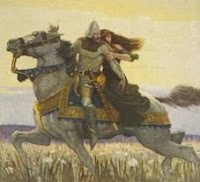 Mansoor and Leece rode to victory on the backs of the brown-skinned residents of our city, through the campaign contributions provided by outsiders and the support of those on the radical right. They've aimed our city down the road of intolerance, with Your Neighbor's hand firmly on the steering wheel. Eric Bever and perhaps others with similar views are poised to perpetuate this direction as they seek seats on the City Council next year. It's not too early to consider just what the perpetuation of this direction means to the city. While the debate about where to place the next skate park occupied a big hunk of the Costa Mesa City Council meeting Tuesday night, there was an equally interesting item on the agenda. That item, the appeal of the Planning Commission's decision to chop developer Barry Saywitz' proposed condo conversion of a twelve unit apartment complex on Victoria Street on the Westside of town by 25%, will likely result in legal action by Mr. Saywitz against the city. The project in question was in the pipeline before the City Council imposed a moratorium on any such projects and, based on the general understanding of the rules, was not restricted by the pending rules changes. Saywitz was not asking for any special treatment - he requested no variances from the guidelines. 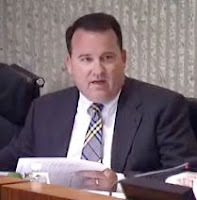 Regardless, during several sessions before the Planning Commission and City Council Saywitz was forced to agree to an extraordinary number of "conditions of approval", several of which would prove costly to him as he attempts to help chip away at the renters/owners housing imbalance in this city. However, that apparently was not enough for some city officials. You will recall that I've reported a couple times in the past that Saywitz has been harangued and harassed by rookie planning commissioner James Righeimer - the carpetbagger who landed his job on the commission in what certainly looked like pure political pay back because he's a pal of Congressman Dana Rohrabacher - a huge supporter of our young jailer/mayor and his barnacle, Wendy Leece, during the campaign last year. Riggy, as his GOP buddies call him, took Saywitz to task several times in a manner that was more inquisition than information gathering. At one point during a recent meeting his antics incurred the wrath of the commission chairman, curmudgeonly ex-mayor Donn Hall, who looked like he was ready to take Riggy out to the woodshed for a good whuppin'. It certainly does look like our city officials, Righeimer in particular, have changed the rules on Saywitz in the middle of the game. From all appearances, through all the harassment and appeals, he seems to have kept his head and tried to meet every demand made of him - regardless how unreasonable they might have been. I, for one, will not be surprised if he seeks a legal remedy to this situation. If he does, the result can be laid squarely at Righeimer's feet. What ever personal problems exist between Righeimer and Saywitz, they should be left outside the chambers. We, the tax payers of this city, should not be expected to foot the bill for Righeimer's personal vendetta. Righeimer is a tough guy to figure out. First he's handed a plum job on the Planning Commission even though he'd lived in our city for a few months. Then he somehow manages to land a coveted assignment as a weekly front page columnist on the Daily Pilot, in which, we were told, he would provide a "conservative" view of the world in our area. Each of these roles provides him with a tremendous vantage point from which to present his philosophy and display his skills, not to mention a double spring board to whatever office he seeks to attain next year. In my view, Righeimer has bungled both of these jobs so far. On the Planning Commission he has demonstrated a propensity to bully applicants - Saywitz is a perfect example - and a willingness to forego the common courtesy expected by a commissioner on the dais. From his bully pulpit (so to speak) of the Daily Pilot column he has managed to anger residents in both Costa Mesa and Newport Beach - not smart for a guy who expects to have a future in politics. He actually acts like a guy who thinks he's got that next step on the political ladder locked up. I would urge restraint on his part - the electorate can be fickle. In the meantime, I hope the City of Costa Mesa has set aside a war chest for legal matters - it looks like they may have to dip into it very soon. Quick! Somebody check to see if hell has frozen over! 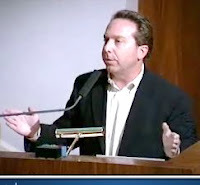 It must have, because at the Costa Mesa City Council meeting last night local Habitat for Humanity honcho Mark Korando and an activist who very much resembles my theoretical character, Your Neighbor, agreed that Lions Park is not the best site for a new skate park. Korando expressed astonishment that he and the activist agreed on something. Politics does, indeed, make for strange bedfellows. 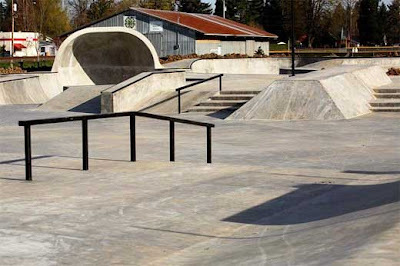 The short version of the discussion of the proposal to fund, to the tune of nearly $80,000, preliminary plans for a skate park up to 25,000 square feet at Lions Park is that it was spirited. The upshot was that Linda Dixon made a motion to put the plan on hold until October, for staff work with the contractor to provide an estimate on a smaller skate park at Lions Park that won't interfere with the pavilion, tot lot or airplane and to provide information about re-opening the Fairview Park master plan to consider the placement of a skate park and a dog recreation area at that venue. Her motion also included direction to consider closing a portion of Park Avenue near Lions Park. The vote on Dixon's motion was 3-2, with our young jailer/mayor and his sidekick, the mayor pro tem, voting no. I was pleased that Wendy Leece took the initiative to pull this item from the Consent Calendar for discussion and lead that discussion to it's conclusion. Finally, an independent act. Many residents spoke passionately on this subject. Several homeowners near Lions Park raised many good questions about the inappropriateness of a skate park at that venue because of loss of green space and other valuable park elements. Representatives of the skate community provided their special insights. I'd like to report that I watched former councilman Mike Scheafer wrap up the public comments with a rousing summation - but I can't. The feed from City Hall went black in the middle of his presentation for what seemed like an eternity. It was actually less than two minutes, including the time it took to get the audio back once the picture returned. Reports from those present advised me that Scheafer's presentation was excellent. I wish I'd heard it all. During the discussion several speakers opined that, because Costa Mesa is home to many major players in the skateboard industry it should be on the forefront with it's skate park efforts. They spoke of a large, world-class skate park that would attract skaters from all over and perhaps become a venue for international competitions. That sounds like something worth considering, particularly as we've now put Fairview Park in play. It will be very interesting to see how this plays out this fall.